Now, a 76-year-old California housecleaner has a message for Barack Obama. "Migrant Mother" (1936) taken by Dorothea Lange for the U.S. Farm Security Administration. You've likely never heard of Katherine McIntosh, 76, a housecleaner in Modesto, Calif., but you'd recognize Dorothea Lange's iconic Great Depression photograph in which the then-4-year-old girl clings to her mother while hiding her face from the camera. In the black-and-white photograph, known as "Migrant Mother," Katherine is the child on the left. Her mother, then-32-year-old Florence Owens Thompson, had seven children at the time, who worked with her in the fields, picking cotton. 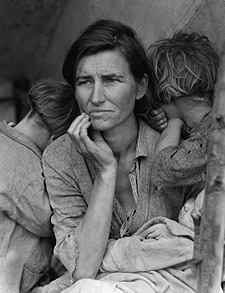 Lange was traveling through Nipomo, Calif., taking photographs of migrant farmworkers for the government when she shot the defining image of the Great Depression. McIntosh told CNN: "She asked my mother if she could take her picture -- that ... her name would never be published, but it was to help the people in the plight that we were all in, the hard times. So mother let her take the picture, because she thought it would help." The next day, when the photograph ran in a local paper, the family had already moved on, but they heard about it. "The picture came out in the paper to show the people what hard times was. People was starving in that camp. There was no food," McIntosh said. "We were ashamed of it. We didn't want no one to know who we were." Living in tents and cars, sometimes her mother would go hungry so her children would have food. Florence Owens Thompson died at age 80 in 1983. The inscription on her gravestone reads: "Migrant Mother: A Legend of the strength of American motherhood." In these tough economic times, her daughter has this message for President-elect Barack Obama: "Think of the middle-class people." Let us be the first to suggest that McIntosh would make a wonderful honored guest at Obama's inauguration in January.